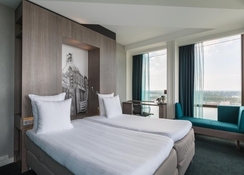 Hotel Ramada Apollo Amsterdam Centre is a spectacular hotel offering 446 spacious and comfortable guestrooms. Located opposite the lovely Rembrandt Park in central Amsterdam, this 4-star hotel is only a few minutes from the historic city centre. This 18 storied hotel complex boasts of meeting spaces, a state of the art gym, an onsite spa and various leisure facilities. The onsite restaurant is situated on the 17th floor, offering unobstructed views of the city below while you dine on pure French and/or international cuisine. The complex has indoor parking facility for up to 300 vehicles. The hotel also offers free shuttle from the Schipol Airport. 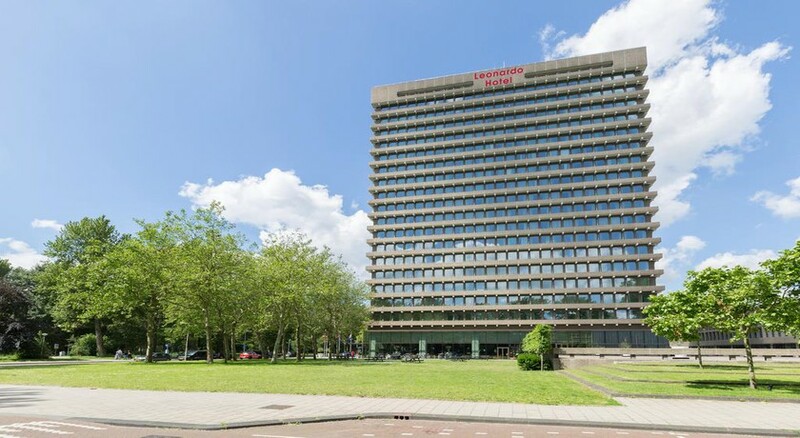 The impressive Hotel Ramada Apollo Amsterdam Centre is situated about 15 minutes from the old city centre and is ideally located near the Amsterdam ring road, directly opposite the Rembrandt park. The park has landscaped gardens as well as a swimming pool. The Amsterdam Airport at Schipol is only 12.7km from the property. Hotel Ramada Apollo Amsterdam Centre features 446 luxurious guestrooms that are categorised as standard room, standard room with panorama, deluxe room, deluxe room with panorama, executive king bed, executive king bed with panorama, family rooms, luxury rooms, romantic rooms and non-smoking rooms. All guestrooms offer stunning views of the city of Amsterdam and come with all the necessary comforts required by the modern traveller. Amenities in the guestrooms include a private bathroom (shower, hair dryer, WC), direct dial telephone, electronic key card access, Satellite TV, music channels, air-conditioning, heating, safe box (lap top size), and a balcony or terrace. Free baby cot is available on request. 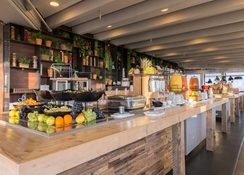 Hotel Ramada Apollo Amsterdam Centre is an all-inclusive accommodation with the main restaurant open for breakfast, lunch, and dinner with an open buffet and themes nights. The restaurant is located on the 17th floor and offers spectacular panoramic views of the city below. The cuisines served here are French and international. There are a wide range of wines to choose from. The ‘Bar & Kitchen Copper,’ also located on the 17th floor serves delicious cocktails and beers. 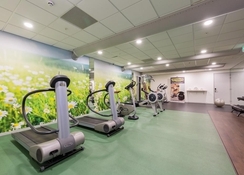 Hotel Ramada Apollo Amsterdam Centre features a state of the art gym fitted with the latest equipment and free weights. There’s also an opulent spa that offers a wide variety of massages, treatments and therapies. 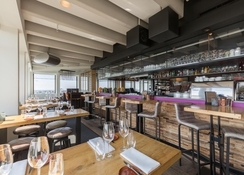 Friendly staff, clean rooms, nice restaurant and best views in Amsterdam. Excellent location. 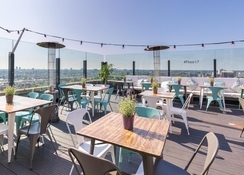 Great roof top bar.